This variety is a high quality slicing cucumber produced on a bush type plant, ideal for small gardens or containers. Produces an abundance of 8Ó fruit with excellent flavor. 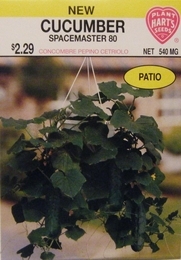 Resistant to cucumber mosaic virus, scab and moderately resistant to Downy and powdery mildew. For best flavor, pick fruits when 6-8 inches long. High fertility and plenty of moisture will stimulate growth and increase yield considerably. 3lbs of Cucumber seed needed per acre. On average, 1oz of seed can produce 800 Cucumber plants.